As Occupy Harvard prepares to weather the winter in Harvard Yard, the rest of us —with the possible exception of Primal Screamers thankful for the temporary ban on tourists —secretly hope that the cold will drive them out. Over the past several months, the tent city has expanded although the numbers of occupiers seem to have dwindled, their tactics have grown more disruptive, and I—once genuinely curious about the potential effects of the Occupy Harvard movement—have grown more and more eager for its exit. To be sure, I agree with many of their demands—a living wage for employees, socially responsible and transparent investments, and increased diversity among the faculty to name a few—and I know and like many of the undergraduate Occupiers personally. But as a liberal, every time I am told that someone is ‘surprised’ that I am not occupying the yard myself I feel an easily explicable surge of anger. In her op-ed for the Crimson, Lucy O’Leary ’12 argues that the ‘minor inconvenience’ of shutting down the Yard is nothing compared to the gains Harvard janitors won–as she puts it, through Occupy Harvard’s presence. It’s a rather presumptuous statement for these students to make, and completely invalidates the hard work Harvard’s employee unions actually did to accomplish this change. She references Alexandra Petri’s joke about janitors earning $300,000 a year—near the top 1 percent, O’Leary declares—as proof of ignorance about the occupy movement. Petri was clearly being facetious, but let’s face it—Occupy Harvard knows it’s not the dual-earner family making $300,000 a year that’s causing mass inequality. It’s the 0.1 percent and the .01 percent, whose net worth increases exponentially from even the 1 percent. But that doesn’t make for a catchy slogan. Instead, Occupy Harvard focuses on a very narrow base of support to grow its movement. With actions such as picketing and attempting to interrupt a Goldman Sachs recruiting session—the attendees of which will probably go on to be in the 1 percent, but almost certainly not the .01 percent—Occupy alienated a large portion of the student body that might have been persuaded to be sympathetic to their causes. No social movement was ever built on a narrow base: women led the charge for women’s suffrage, but they needed male allies; gay activists picketed the streets, but heterosexual allies were essential to social and political change. Likewise, future Goldman Sachs employees of America can care deeply about labor rights and socially just investments while also wanting a cushy paycheck. Yet they’re not likely to line up behind the Occupy banner when Occupy Harvard’s disruptions result in cancelled information sessions and jeopardize their opportunities to find jobs. A friend who recently began work at a top management consulting firm occupied Wall Street the week before starting work, because he, like other Harvard students who choose to go into consulting or finance after graduation, are well aware of the flaws in the system. For others going into those fields, it’s a chance to access privilege they had never been privy to before, and many intend to use their paychecks for social justice. Certainly, Goldman is a worthy target of the Occupy movement more broadly, but picketing an information session run largely by young professionals just a year or two out of Harvard achieves little other than alienating potential allies. For Occupy Harvard, there is a “with us or against us” mentality, and there is no middle ground to work with students who they may agree with on some issues and have disagreements with on others. The downside of this is that the sheer self-righteousness of many of the occupiers renders an alternate version of events inconceivable. In her recent op-ed, Sandra Korn and fellow occupiers dismissed the University’s concerns for student safety—most shockingly the University’s statements about concerns over sexual assault—as illegitimate. “You make reference to incidents of sexual assault at other Occupy sites, which are abhorrent. However, we invite you to compare the number of such incidents with that of sexual assaults occurring, for example, on Harvard’s campus and in final clubs,” they wrote. Apparently to the Occupiers, the fact that sexual assaults occur—an unfortunate but inevitable reality—invalidates the University’s attempt to prevent more such incidents from occurring, especially in a space populated exclusively by our most vulnerable population, first-year students. Similarly, this leads to a single point of view on what Occupy has dubbed “180:1”—the ratio between the salaries of the highest paid employees of the Harvard Corporation and the lowest paid employees at the University, the custodial staff. Among the other disparity issues Korn cites in her op-ed on is Drew Faust’s salary, coming in at $875,000. To be sure, I am not excusing or supporting a $8.4 million paycheck for the HMC’s Stephen Blyth, especially while others don’t make a living wage, but Occupy is vehemently opposed to even smaller wage differences. Faust’s salary is not incongruent with those of other Ivy League presidents. In fact, it is about half of that made by Yale’s president. It is rather clear that Occupy’s goals are about inciting antagonism towards the University rather than providing those comparative facts. Similarly, Korn fails to mention that Yale’s chief investors do make less, while that’s because Yale outsources much of the work that Harvard’s investors perform in-house, resulting in smaller amounts paid out to a larger group of people. I would love someone to invest on our behalf pro-bono or at a lower wage, but if we’re talking about numbers let’s provide accurate comparisons rather than alienating Drew Faust over her sizeable, but well within the norm, salary. As O’Leary claims, complaining over the lockdown of the yard trivializes the issue. Americans are angry, and they well should be, but Occupy Harvard has little to do with the Occupy movement more broadly. Rather, the students occupying Harvard Yard are doing more to set back the causes they claim to champion in the long run than they are to advance them, and that is not a trivial issue. A survey of over 1000 undergraduates performed by Stats 104 students found that Occupy Harvard was viewed favorably by only 2.84 out of 10 students, surely much lower than student support for the individual issues they’re pushing for and much lower than Harvard’s support for the Occupy movement nationally. The Occupy Harvard message isn’t working, and the movement is a coalition of a 0.1 percent. They would do well to tone down the rhetoric, tear down the tents, and try to bring more students in for a truly strong student movement. Katie R. Zavadski ’13 is a comparative study of religion concentrator living in Lowell House. Occupy Wall Street could have become relevant through backing Obama’s jobs bill. 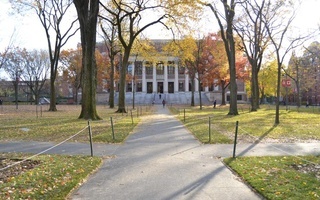 Occupy Harvard’s detractors should also stop cloaking their opposition in Harvard’s progressive financial aid provisions. Yes, Harvard’s financial aid policies are commendable, but the Harvard student body is hardly representative of all economic classes. About 70 percent of Harvard students receive financial aid—but 30 percent do not. In a bitterly ironic twist on the protesters' slogan of “taking back Harvard for the 99 percent,” their actions have truly closed off Harvard’s campus to all but a select few.